We all know how useful and handy can Google Maps be. Whenever we don’t know a route for a particular location, we can open Google Maps and check the route for that location. The route that Google Maps suggests may not always be the most appropriate. Lets say you want to guide a friend to reach your office. The suggested routes are not always perfect and let’s say there is some roadwork going on and the route is closed temporarily. Wouldn’t it be great to create a custom route through Google Maps, so that you can guide your friend the exact route or even show a shortcut that is not covered in the map. Creating custom Google maps is very easy. Head over to maps.google.com and Sign in to your Google/Gmail account. You can also create a Google account, if you don’t already have one. After signing in, you will be redirected to Google Maps. In the search bar, type the address for which you want to create a custom route. This is just to speedily browse to the location. Now click on My Places and then on Create Map, give this route a proper title and description. Below you can see two options – public and unlisted. Selected “Public” if you want to share this map with everyone, also this map will be displayed in search results and user profiles. Select “Unlisted” if you don’t want to share this map, but this map can be viewed if someone has a direct URL. Finally click on “Done” to save this map. If you’re already in “My Places” then click on “Edit” to edit this place. You will see three different icons on map. Click the small downwards facing arrow to the right of the line button and you’ll see three different options. You can select any option from here, as per your wish. It really depends on how you want to plot the route. The first “draw a line” option allows you to plot a route anywhere on the map, the second option allows you to snap the route to visible portions on the road. The third option allows you to draw a shape on the map. For this task, we will be using the second option to “Draw a line along roads“. Use this second option to draw a line and create your custom route. If you reach to the end of the map, click and drag the map to scroll it accordingly, to create the route. When the process of creating a route completes, click on the last point again to end that route. A bubble will appear along the route so that you can type the name and description. Click on OK to save the details. Good going, now that the route is created, its time to add more details. Now we can use the “Add a placement” button, to drop markers anywhere in the route. This is just to add additional information in the route, suppose you want to say that “Starbucks here”, want to add a personal comment or want to clarify a part of the route. When you place the marker, a bubble will appear in which you can add more information about that marker. Click the “Rich text” link to add a hyperlink. Or use some catchy fonts just for the sake of showoff. Click on OK to save it. Now that everything’s done, from the top left corner, click on that hyperlink icon and get the URL for this route. You can also “Print” this, by clicking on the print icon next to hyperlink icon. Note: In “Privacy and sharing settings” when creating a map, even if you’ve selected “unlisted”, still you can send the URL to any person and he/she can view your custom map. 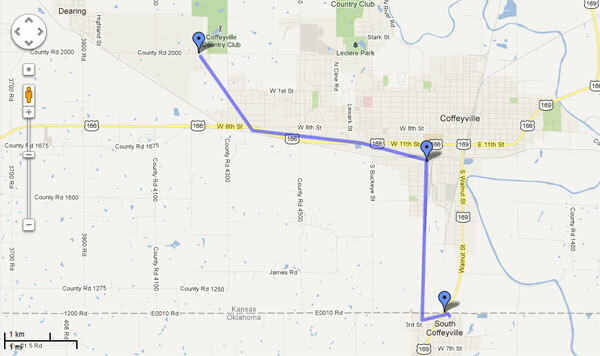 How can creating custom routes through Google maps be helpful? Whenever you want to guide someone about the location, you can use this method. A route which is unknown may create problems for that stranger. 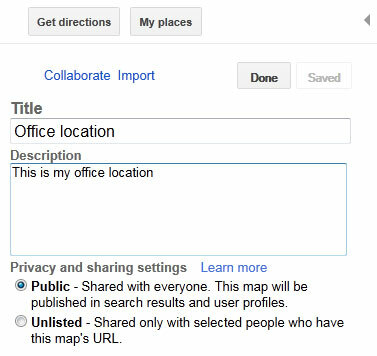 Instead, use this method to create custom Google maps and send the URL to that person. But that’s not all, if you’re creating a business card and want to show the route (location) to your office, then this method can give that professional touch to your business card. Go, create one for yourself. I was not aware of that feature in Google Maps. I think that can be very useful. I will give it a test next time I need to make a map.